Just another of my submissions for SU! 's monthly contest. Super quick and easy! The apple is cut out and popped up on a dimensional. Have a great weekend! It may be quick and easy but it really catches the eye! Fabulous card! 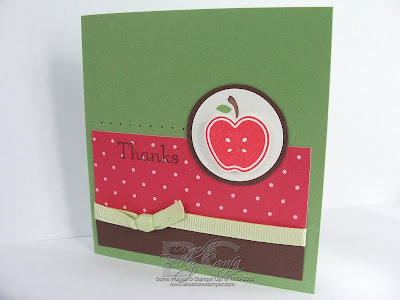 This is a fun, clean looking card, I really like the colors, layout and how you popped the apple! This card is so bright and cheery! Love simple layout and the bright colors! Fabulous! This is super cute. Love the apple color combo! It may have been quick, but it is so super cute! !